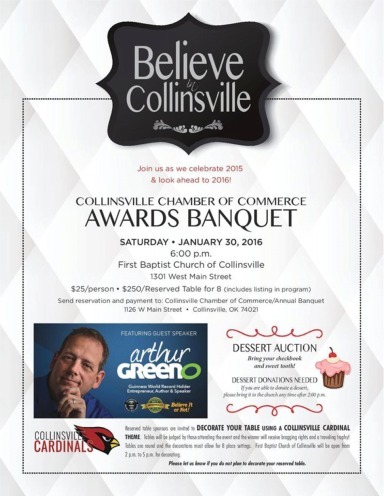 The annual Collinsville Chamber of Commerce Awards & Installation Banquet was held in the spacious new First Baptist Church Impact Center at 14th and Main, Saturday January 30, 2016. Arthur Greeno was the key note speaker for the 2016 Chamber Banquet. Minature Chick-fil-A cows were parachuting down to the crowd before Arthur Green's presentation ended. Arthur Greeno's message was to do "remarkable" things in your life. He is the owner of two Chick-fil-A franchises (Tulsa & Owasso) and holds two Guiness World Records. These ladies helped with the parachuting cows. Scott Reeves will lead the Chamber of Commerce as President in 2016. A nice sized crowd attended in the new downtown Collinsville facility. James Roderick & Eric Lassiter auctioning desserts for the Chamber's budget and activities. The Collinsville FFA Alumni sponsored a table for these current students. These CHS students were among those from the National Honor Society serving the meals. Sherry Campbell is an out-going board member having served two years. Brady and Jackie Stephens received a Gold Key award for their substantial investment in Collinsville.. The Collinsville Tri-County Fair Board received Community Service awards. (L-R) Steve Brenan, Carolyn Smith, Sandi Phelps, and Susan Worstell. Beth Ann Langston received a Gold Key award. Cynthia Reed received the Presidents award. Josh Kelley was selected as the Collinsville Chamber of Commerce Member of the Year. U.S. Congressman Bridenstine's representative, Dan Snow, presented letters of recognition to the award winners. Reciting the officers vows from memory can be a challenge ... as Scott Reeves had to peek at Teresa Brown's notes. Out-going Chamber President Teresa Brown swore in the 2016 officers: Scott Reeves (President) , Shelley Nachtigall (Secretary-Treasurer), and Robert Miller (VP). Several of the NHS students assisted with the dessert auction.